A variety of factors go into the methodology for ranking colleges, including outcomes measuring student graduation criteria, faculty resources, expert opinions via peer assessment surveys, financial resources, student excellence and alumni giving. To qualify to be ranked, schools must have their undergraduate business program accredited by the Association to Advance Collegiate Schools of Business (AACSB). 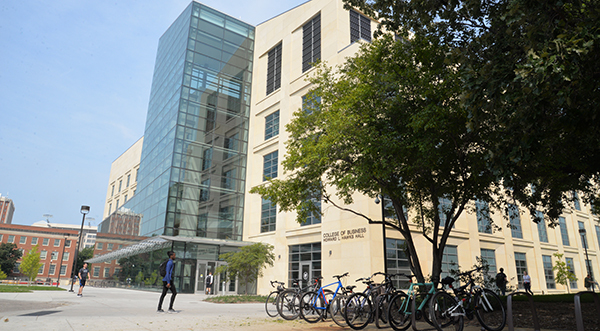 In addition to moving into the new Howard L. Hawks Hall in 2017, the undergraduate programs received a boost through new global immersion opportunities, greater facilitation of tutoring help through the Teaching and Learning Center and enhanced access to financial data through the incorporation of Bloomberg terminals into the new trading room. Nebraska Business also continues to make strides by integrating strengths-based learning to all students via the Clifton Strengths Institute – the only program of its kind in the world. Dr. Kathy Farrell, James Jr. and Susan Stuart Endowed Dean of the College of Business, praised the efforts of faculty, staff, students and alumni for creating a community that facilitates growth. She believes the rankings reflect tangible contributions made by thousands of individuals. Nebraska Business offers 10 undergraduate majors – accounting, actuarial science, agribusiness, business administration, economics, finance, international business, management, marketing and supply chain management. Business minors offered include global leadership, entrepreneurship, business analytics, a business minor for non-business majors and a brand new law and business minor taught by professors from the Nebraska College of Law. To view complete rankings from U.S. News & World Report, visit: https://usnews.com/best-colleges/rankings/business-overall.